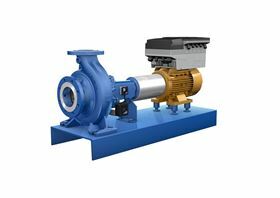 The KSB Guard pump monitoring system enables existing pumps to be connected to the Internet of Things in just a few minutes. (Copyright: KSB SE & Co. KGaA, Frankenthal). Networked vibration and temperature sensors fitted directly to the pump make availability at plant level transparent for the first time. The system is designed to changes in the operating behaviour of the machine at an early stage, allowing maintenance work to be better planned without having to be on site with the pump. KSB Guard can be retrofitted. The sensor unit is attached to the bearing bracket or the drive lantern of the pump using a magnet and adhesive, and mounted during operation with no need for changes to the machine. The data is captured hourly and is transferred directly and wirelessly in encrypted form to the KSB Cloud via a gateway for processing. Users can query the status data of all monitored pumps at any time and from any location using their mobile phone, a tablet or a PC, without having to be on site. Other information on the pump, including the operating manual and exploded view, can be called up with a few clicks.